A friendly debate leads twins Bill and Mary to compare rubber balls, rafts, and gloves with glass marbles, greenhouses, and jars, objects that at first seem very different. A field trip teaches them that both rubber and glass can bend, bounce, stretch, and even melt. This lively story introduces the concept of properties. As scientists know, properties are characteristics that help us understand the traits of substances all around us if—like Bill and Mary—we observe closely. 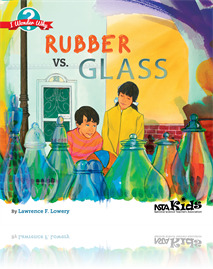 Rubber vs. Glass is part of the I Wonder Why book series, written to ignite the curiosity of children in grades K–6 while encouraging them to become avid readers. These books explore the marvels of light, color, machines, sound, and other phenomena related to physical science. Included in each volume is a Parent/Teacher Handbook with coordinating activities. The I Wonder Why series is written by an award-winning science educator and published by NSTA Kids, a division of NSTA Press.